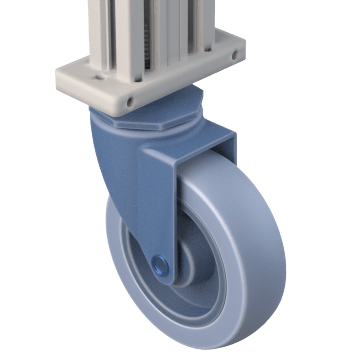 Screw these threaded stem casters into a compatible threaded socket or insert the stem through a mounting bracket or fixture and secure with a nut and washer. Commonly used in pipe or tubing framing. Use these casters in food service and washdown environments, such as in commercial kitchens, restaurants, and food packaging facilities. They've been tested to meet National Sanitation Foundation (NSF) requirements. 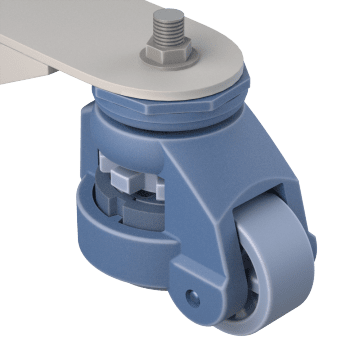 Attach these casters to chairs and other office furniture in light use environments where the casters aren't exposed to heavy loads, chemicals and other liquids, or high temperatures. 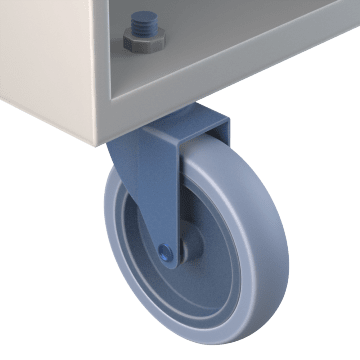 Soft wheel casters are less likely to damage hard surfaces, and hard wheel casters are for use with low- to medium-pile carpeted surfaces since they won't grab or snag carpeting during transport. 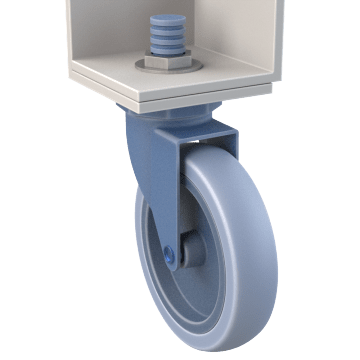 Equip carts and other equipment with these precision bearing casters for smooth, quiet rolling and swiveling to quickly get your equipment where it's needed while maintaining a high level of control. They resist chemicals and have nonmarking treads to help protect flooring. 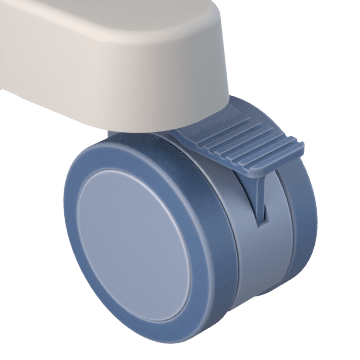 They're designed for medical equipment, but work well for other applications that call for a smooth, quiet caster. 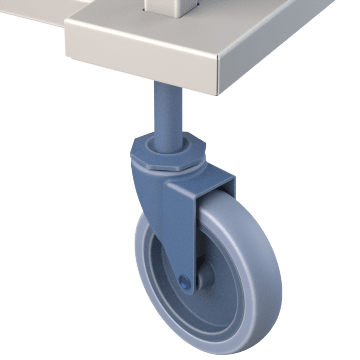 The twin wheel design of these casters distributes weight more evenly, provides more load support, and improves maneuverability by easing swiveling compared to single wheel casters of the same diameter. They resist chemicals and have nonmarking treads to help protect flooring. 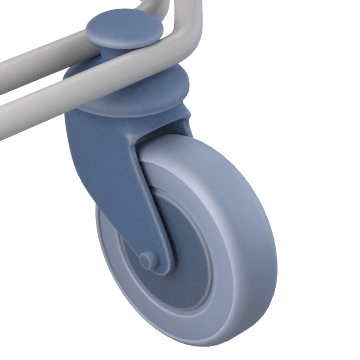 They're designed for medical equipment, but work well for other applications that call for a smooth, quiet caster. Roll your ladders and work platforms from job to job with these casters. They have an extended stem that threads into brackets or frames for a secure hold. The stem is spring loaded, so it retracts when weight is applied to keep equipment stationary while in use. Easily move equipment and furniture, then adjust the built-in pads on the casters to precisely level and keep your object stationary. The casters have an integrated wheel that moves the pads up or down, helping you to achieve exact leveling. They also include a replaceable stem to customize your mounting options and a nut to secure the stem. Select casters based on the weight of the object to which they'll be attached; the object should weigh no more than 2 times the maximum weight capacity of a single caster. 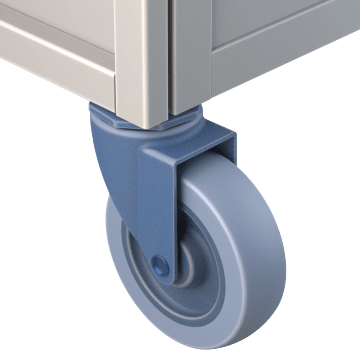 Keep shopping carts rolling smoothly with these durable casters. They resist wear and have nonmarking treads to help protect flooring. Self-stopping casters are designed to automatically slow down and stop rolling when left unattended and to hold in place on small slopes. They work best when used as a pair on the front of a cart. 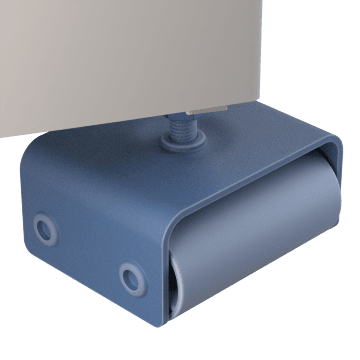 Antistatic casters resist static buildup to help prevent shocks to the user. Put these low-profile casters on refrigerators and other typically stationary heavy appliances so that they can be moved when needed for cleaning or maintenance. 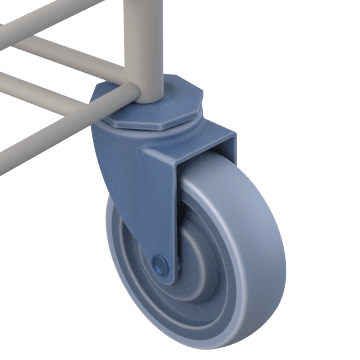 They have dual wheels to help distribute and support heavier loads, and the low profile helps make them easier to maneuver than taller casters.